The Kepler mission, as we know it, is over. Because of the irreparable failure of a critical reaction wheel, the space-based telescope no longer has the ability to stay pointed at its 150,000 target stars with the precision required to detect the minute changes in the stars’ brightness that occur when planets transit. Kepler has discovered 151 “confirmed” planets plus 3,548 more “candidates”, and there are undoubtedly many more planet discoveries hidden in the data that Kepler has already taken. But NASA is looking forward to what Kepler can do with the pointing capability it still possesses using only two functioning reaction wheels. The team put out a call for ideas, all of which are now available for viewing here (many of these proposals have also found their way to the astro-ph archive over the last few weeks). In this post, we’ll take a look at some of these ideas, which range from monitoring near Earth asteroids to studying blazars. Kepler’s original goal was to determine the frequency of Earth-like planets around Sun-like stars, a quantity called “eta-Earth”. Some astronomers argue that Kepler, despite its crippled state, can still achieve this goal. Borucki proposes to first determine how the frequency of planets varies with planet mass, orbital period, and stellar type, then interpolate across these distributions to find eta-Earth. They advocate that Kepler continue to search for transits around the same stars, even though only large planets (which make a large transit) will be detectable. Taking advantage of the long baseline of data already available for these targets will reveal the frequency of planets with longer periods — a vital piece of information for inferring eta-Earth. Fabrycky et al. also argue for keeping Kepler pointed in its current direction. Measuring additional transits for planets that have already been detected can reveal “transit timing variations”, or TTVs. These occur when there is a planet in the system that does not transit, but does exert a gravitational force on another planet that does transit, causing the time between transits to vary. So TTVs can reveal Earth-like planets without actually needing to detect their tiny transit signature. Hogg et al. suggest that Kepler’s current problems can be overcome by creating a detailed model of how each pixel of Kepler’s detector behaves. Kepler’s problem is that each star’s data is spread across multiple pixels as the spacecraft’s pointing drifts, but this is also the information required to generate this model. Once a model is made, new Kepler data can be corrected, and the mission can operate as originally planned, searching for minute transits of Earth-like planets. The model could even be retroactively applied to the data Kepler took over past four years, improving its quality. The Kepler telescope was designed to detect transiting planets, and many proposals argue that Kepler should keep it up, albeit on a new set of stars. Beichman et al. and others advocate for surveying several fields of stars in the ecliptic plane because Kepler’s pointing problems are minimized when it aims its camera within the ecliptic. The downside to changing targets is that each new field of stars would be monitored for several weeks (instead of years), so only planets on small orbits (which transit frequently) could be discovered. Jackson and Lloyd et al. argue that Kepler should embrace a dedicated search for short-period planets, which are themselves interesting from the point of view of planet formation theory. Caldwell et al. and Demory et al. suggest that Kepler focus on K and M type stars, or even brown dwarfs, which are smaller (so small planets can make a big signal) and fainter (so planets on small orbits could potentially be habitable). These stars would also be closer to the Sun than Kepler’s original targets, making their planets more amenable to follow-up observations with other telescopes. Kilic et al. recommend that Kepler search for transiting planets around white dwarfs. White dwarfs are very small, so a transiting planet would block a large fraction of the white dwarf’s light, making a signal plenty large for Kepler to detect, even with its decreased precision. Source Stars, Lens Stars, and Planets: Microlensing! Gould & Horne suggest that Kepler could help find planets in a wholly different way — microlensing. Microlensing occurs when light from a far away “source” star is bent by the gravity of a “lens” star on its way to Earth, resulting in a temporary magnification of the source star as the two stars move in and out of perfect alignment. If a planet happens to be orbiting the lens star, the planet’s gravity introduces an additional magnification. Detecting a planet this way involves seeing a temporary change in a star’s brightness, which is precisely what Kepler was designed to do, except in this case the planet causes the star to get brighter, rather than dimmer. Microlensing events are rare, so catching one requires a large number of stars to be continuously monitiored — another strength of Kepler’s design. To maximize the number of potential targets, Kepler should be re-pointed towards the galactic bulge. Kepler wouldn’t be doing this project alone; a network of ground-based telescopes would also monitor the same stars. Microlensing signals look slightly different when viewed from different angles, and data from this additional vantage point (called “microlens parallax”) allows for considerable more information to be deduced about the lensing planet, such as its mass. 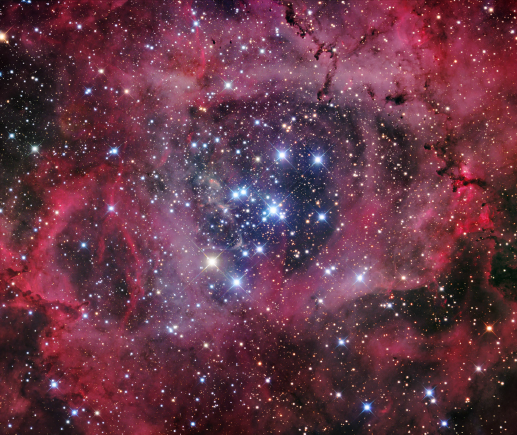 The open cluster NGC2244, a potential future target for Kepler. Kepler monitored the precise brightness of thousands of stars while looking for transiting planets. But stars also change their brightness when they pulsate, rotate, accrete material, and go through cycles of activity. These fluctuations can be large enough for Kepler to measure, even with its reduced precision. By studying these behaviors, we can learn about the interior structure and function of stars, as well as their interaction with circumstellar disks. The primary Kepler mission specifically avoided young, variable stars, as the stellar brightness fluctuations would hide transit signals. Aigrain et al. and others propose monitoring several young stellar associations and open clusters. These are groups of stars that all formed recently from the same molecular cloud. While the stars in the group have a range of masses, they all have the same age and initial chemical composition, making associations and clusters great laboratories for the study of stars. By studying several clusters of different ages, we can learn how populations of stars evolve with time. Aerts et al. specifically propose to monitor a young open cluster named NGC2244, home to several very massive (and rare) O and B stars, which we know can have strong brightness fluctuations. Studying the workings of these stars will give us a better understanding of the supernovas that they will eventually become and their role in enriching the galaxy with heavier elements. Kepler is well suited to this task. Its very large field of view would allow an entire cluster or association of stars to be monitored simultaneously, and the fact that Kepler is in space means the stars could be monitored continuously without the interruption of the day/night cycle. Kepler could also do interesting science by studying objects much closer to home. The comet 67P/Churyumov- Gerasimenko is approaching the inner solar system. A probe called Rosetta is already en route to the comet, with an ETA in May, 2014. Edberg et al. suggest that Kepler could observe the comet’s tail from afar at the same time that Rosetta takes detailed measurements of the comet from up close. Of particular interest is how the comet changes as it gets closer to the Sun and heats up. Marley et al. argue that, if Kepler is pointed in the ecliptic (as other proposals suggest), then Neptune should be included in the field of view. Detailed monitoring of Neptune over time could reveal the planet’s oscillations, which hint at its internal structure and composition. An artist’s conception of an AGN illustrating the relativistic jets. 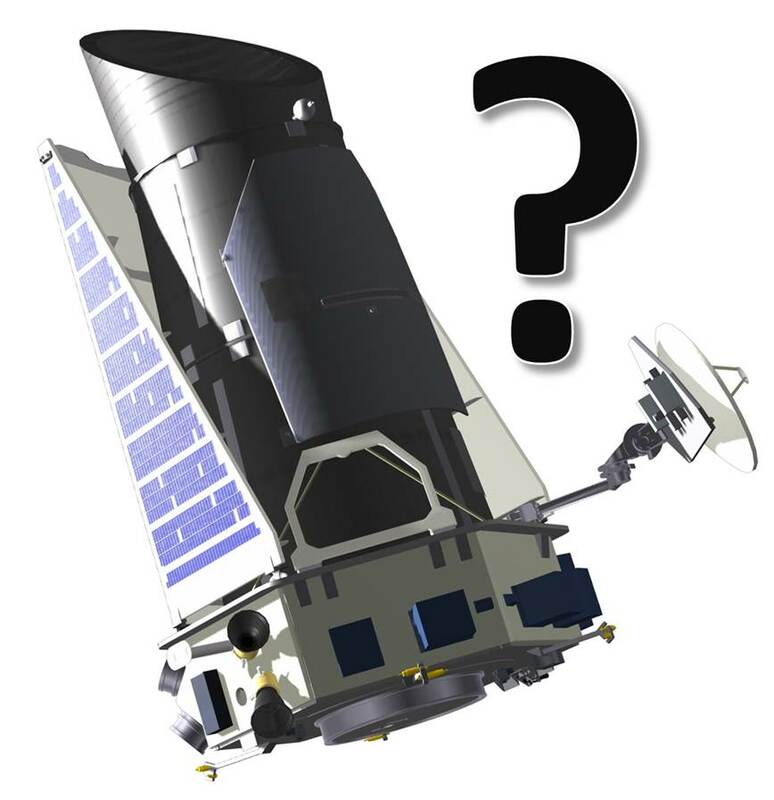 Kepler’s future could involve monitoring the variability of these objects. Elvis et al. and others propose to observe near Earth asteroids with Kepler. Monitoring the amount of Sunlight that is reflected off an asteroid over time reveals the shape of the asteroid and how it is spinning. An improved understanding of these objects will shed light on the history of the solar system, locate potential targets for visits by manned or unmanned probes, and warn us of objects that may collide with Earth. We could also use Kepler to study the universe outside of our galaxy. 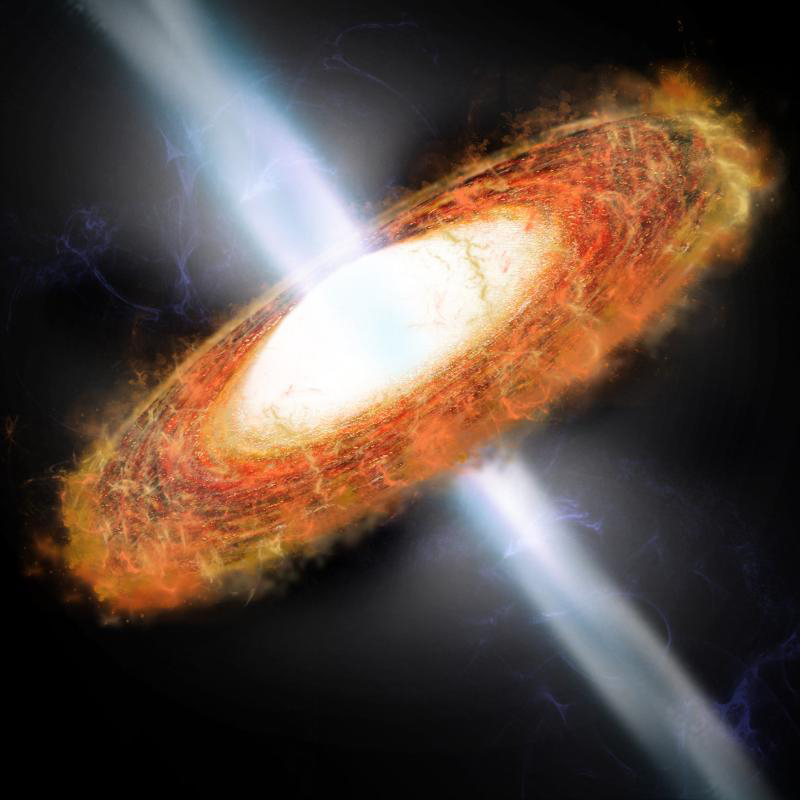 Some galaxies have supermassive black holes at their center; if material is falling into the black hole, we call these objects active galactic nuclei (AGN). Edelson et al. argue that, regardless of where Kepler is pointed next, the AGN in that field be monitored. High cadence, continuous monitoring would give clues to the mass of these black holes and the mechanism by which material falls into them. AGN also launch two relativistic jets. If one of these jets happens to be pointed toward the Earth, we call it a “blazar”. Blazars vary with time, and Carini proposes to monitor them with Kepler in the visible wavelengths while simultaneously monitoring their gamma ray brightness with other telescopes. Such observations could reveal how these relativistic jets are formed. What do think should be next for Kepler? Let us know in the comments below! Of all the proposals the one that, for me, seems to be of greater interest would be the one from Aigrain et al. The study of clusters and associations would be vastly improved with an instruments like Kepler. As for planet hunting, Kepler already did a great deal in that field and if it is no longer as precise executing that job, it should move on from that task. Of course my view is somewhat biased as I am interested in this field but, of all the alternatives, studying star formation and cluster membership, seems to be the one that would have a greater impact and science output. Too many interesting tasks for a tiny crippled instrument ! The priority should be given to improve our knowledge about properties and physics of planetary systems already detected by Kepler. The second priority should be given to study of variability / seismology of stars which gives valuable information about their internal structure and evolution, and it is very difficult to perform the necessary observations from ground.